This is the black era radiator which works for both high cowl and low cowl. I'm pretty sure this is correct (all I had to do is go into the garage and look at my car). Just in case I've missed something, please let me know, I'd like to be absolutely correct. The next assembly will be the 1926-1927 as soon as I get a good close up of the front end where the radiator mounts...also would like pictures of the fender iron as bolted to the frame. This is certainly going to help me. I will be installing a new rad soon. I know I have all the right pieces but am never certain if the order is correct and none of the instructions I've seen are as crystal clear as this. Thanks for posting. Image saved! Very nice and detailed drawing Martin! The one that came with the kits I bought wasn't as detailed and clear as this. I have 3 black era T's and each had its issues when I installed a new mounting kit after the chassis was completed. The mounting kits work fine IF the frame, radiator, and radiator and everything else is within spec. Its sounds simple enough but that bit of information should be added to the kits instructions I think. Martin, Nice drawing. This post http://www.mtfca.com/discus/messages/411944/505399.html?1419948417 contains a copy of the graphic that is supplied with the repro kits for 26/27 cars. The placement of the apron is a bit unclear, and a better drawing for reference would be much appreciated by the community. Martin - you need to revise the dates. 1917 and 1918 did not utilize the thimble set up - that came about around 1919. Very nice drawing. This type assembly was used from 1919-1925. 1917-1919 (I don't know the precise ending date) was still mounted as the earlier 1916 brass ones. IE no metal cones were used and the hole in the radiator mount and shell was small (just the size of the threaded stud). Radiator also still sat on a leather pad on the top of the frame. 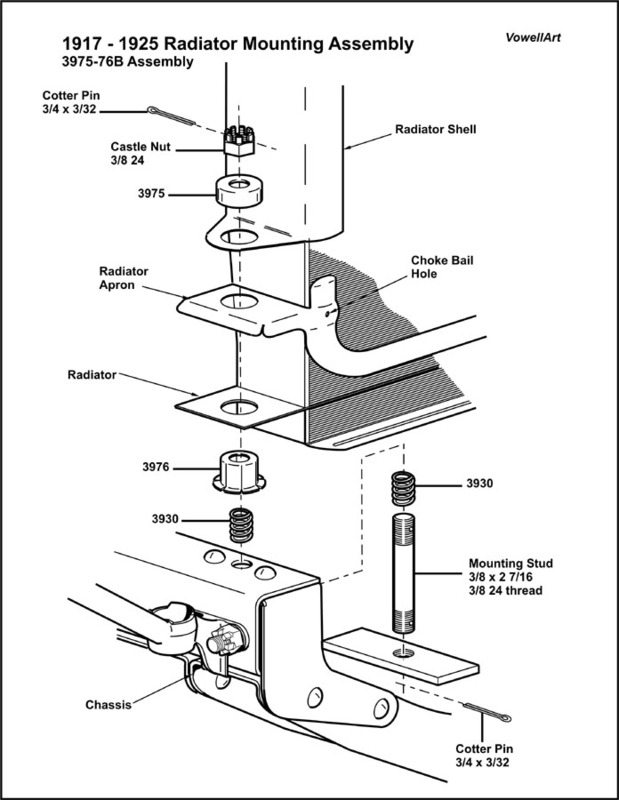 The drawing is of the parts I would use if available but since you stated you wanted to be ABSOLUTELY CORRECT then you need to know that the long washer nut as you drew it up was only used for 26/27. 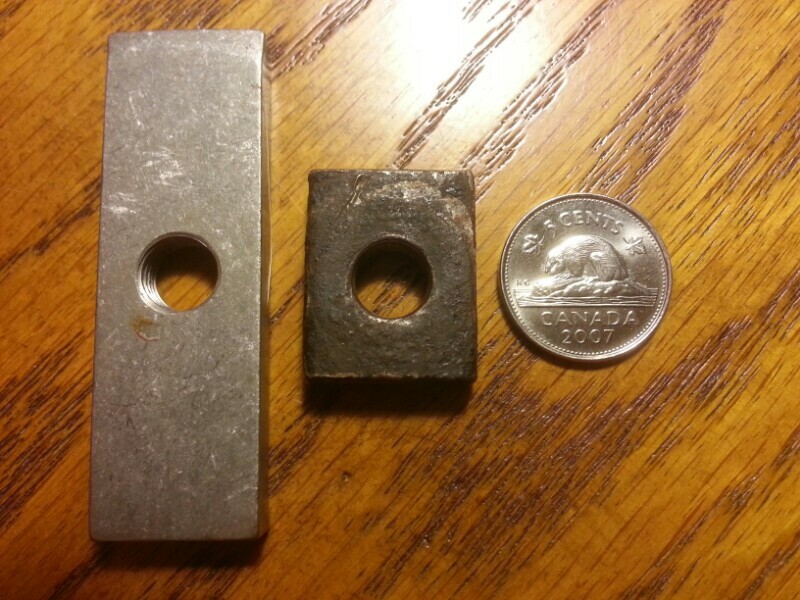 The earlier cars used a washer nut that was almost square as pictured in Steve Jelf's picture in another thread. That threaded block was 1" long by 3/4" wide and the long side was installed parallel to the frame rails same as the long side of the 26/27 washer nut was installed parallel to the frame rails. OOPS I also forgot to point out that the years would not go back to 17 since they were still using the leather pad in 1919. The drawing should be dated 20-25 - the stud length should be 2-7/8 during that time frame and the washer nut should be almost square at 1" long x 3/4" wide. There were other subtle differences but those would not show up in your drawing which I assume is for assembly purposes. OOPs I don't type as fast. Didn't mean to repost info already posted. You could adjust the dates as mentioned for the sake of historical accuracy but, I wonder if that would lead people to seek out the short washer nuts that John mentioned. My '19 had the short ones and they were a pain because they would turn during installation. I just found a set of the long ones at a swap meet and it seems they will work great. No wonder Ford changed them. I think the suppliers only sell the long ones as well. Also, didn't the 1923ish '24-'25 have a large rad apron that covered the front cross member like the '26-'27s?? Bruce's bible would be the best source to compare model year changes. Larry you're right. The low radiator years 17-22, didn't have the apron and only the trim piece. The later years mid 23? thru 27 had the radiator apron. I learned something. I didn't know what a washer nut is. So it's the nut that goes at the bottom of the stud, correct? I believe the long ones came out in '26, am I right? I've always used them, but didn't know the name. Black rad shell begins to appear in about August of 1916 and was fully in use before the end of 1916. The term washer nut was new to me too, so I looked in the 8-5-28 Ford parts book. Sure enough, there it is on Page 26. Part #3931 1/2. Those August '16 cars would be 1917 model year correct? Washer nut, good name for it, I was calling it a bar. All the repro kits I've found had the long one, even on the brass era cars. But the picture Steve, sent me had the small one, which I figured (given how fastidious for authenticity) was an original. On my 1909 - 1916 drawing I show it as an option, maybe I should reverse that. But you're saying that these were used up until 1917 or 1918? Martin, the different mounting kit on the earlier black radiators means the hole in the shell and in the radiator cross bar are only 3/8", to take the standard mounting stud. It is not simply adjusting the order/ type of components used in each type. With your skill and attention to detail, I am sure a second drawing would be the answer. Your right Larry about those calendar years. I guess its the habit I get when buying parts from the vendors by Model years. Never thought about it till now. I always tend to think of the brass years ending in 1916 and connect it with a brass radiator. After reading all this, I decided to dig through my scrap pile to see if I still have my originals and I do. Here is a pic of both types together. The smaller one is exactly 1" long. The larger one is 2 3/8", quite a difference. I believe the small ones are original to my mid 1919 Runabout, branch plant car but of course, I am not certain. I got the long ones from a swap meet. They look like repros to me but I don't know. The problem with the small ones arises when the castle nut on top gets stuck due to rust or paint. The bar turns and comes off, requiring you to try and start it back on by hand and hold it with a wrench that won't fit inside the frame very well. It's more difficult than you could imagine. I bet Ford servicemen complained about it when the cars were a couple of years old and the design was changed. I hope this helps. I take all of what you guys have to say as expert advice, since you're in a better position to know than I am. I was working from vendor parts, that silly cross section and whatever pictures I could get to make the two drawings I have. This new information is going to require a couple of new drawings covering the transition the black radiators made from the old style mounting to the new thimble style and other subtle differences. I'll re-date the drawings, to 1909-1916 (this one will remain the same) 1917-1919 this will be the new drawing with the old style radiator mounting, 1920-1922 for the one I've got now and another one for 1923-1925 with the different radiator apron. For the 26-27 I just need pictures (not an engineering drawing) of the front part near the mount. The chassis is the same basically, the hood shelf, and the fender iron are what's different, those I need to see. If one of you guys with a 1926 or 1927 could post one or two I'll grab them and draw that one up too. Does anybody know what holds the 1924-25 Radiator apron on? Does it sit over the thimble like the 22's does or does it mount with screws like the 1926-27's? None of the vendors show how it mounts.